The Church of Jesus Christ of Latter-day Saints (Church of Jesus Christ) at Lewes Road Brighton, was honoured to have the Mayor of Brighton and Hove, Councillor Denise Cobb, use their Brighton Chapel for the launch of the Sussex Branch of the Royal British Legion’s 2013 Poppy Day Appeal. Bishop Mitchell of the Brighton church, offered a prayer for all those volunteering in the Royal British Legion’s important initiatives, their service in the Legion and those who their service touched. The Sussex County President of The Royal British Legion, Group Captain Derek North DL, reminded the gathering of the reason behind the formation of the Legion in 1921, in the poignant reading of the second verse of Laurence Binyon’s ‘Poem For the Fallen’. 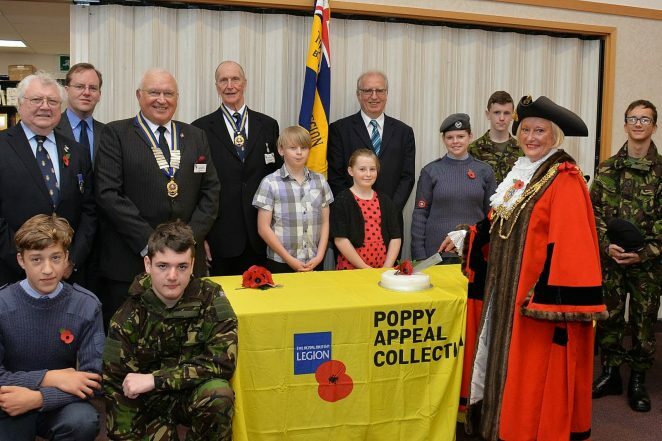 After this, the Mayor of Brighton & Hove, Councillor Denise Cobb, bought the first Poppy and the Royal British Legion’s 2013 Poppy Day Appeal began.